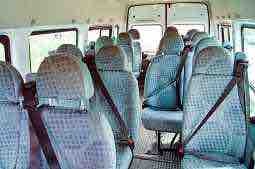 Our dependable Guildford minibus hire can take you to any location in Surrey. Our customers trust us because of our punctuality and excellent customer service. These qualities have helped to make us leaders in transportation right around Surrey. Whenever you are planning a group travel getaway, give us a call or book online. We take care of our clients from the moment they request a quote for our services. Our qualified team members are always ready to give advice on planning your trip so even if you are not sure where you want to go, we can assist. We are familiar with all the best events and local attractions in Guildford. Our minibus hire in Guildford has driving experts who inspire confidence in our clients. This is one of the reasons why our patrons return to us whenever they need assistance with transportation for school trips, weddings, graduations and other important functions. We are always punctual and call you before we arrive so you know that we are on our way. Our drivers are among the best in the industry. Each of them has many years of experience working with tours in general and are well versed in the specific needs that our clients in Guildford have. They know these streets like the back of their hand and make sure that your route is planned far in advance of the date of your trip. Their top priority is to make sure that you arrive at your chosen venue safely. All of our drivers are fully licensed and trained in handling the vehicles in our outstanding fleet. Since they know Guildford well, they can offer inside information on the best places to eat or have a drink after working all day at a seminar. Whether you are in the city for business or leisure, they will ensure that you have a profitable trip. 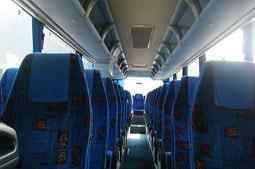 Our buses are the best that the transportation sector has available. Reliable Volvos provide secure storage space for your luggage with airport transfers. Iveco coaches, trendy Ford Transit vans and Mercedes 16 seater buses are also a part of our fleet. 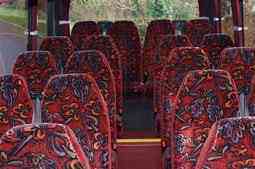 Each coach is fully air conditioned for the comfort of our guests. No matter how long your journey is, you can trust that you will feel comfortable even on the hottest days. Seats can be reclined to any position that you choose so that you can rest comfortably during your trip. Our Guildford minibus hire can take you straight to any event that you plan to attend in the city. Music festivals, comedy, plays and artistic exhibitions are just some of the various forms of entertainment we have available. With our convenient minibus hire service, it is easy for visitors and residents to enjoy any exposition that they choose. Many people visit the area because of a commitment they have to work while others do so purely for leisure. We are just 30 miles from London, so lots of overseas visitors come here when they want to explore more of what England has to offer. Whatever your motivation is and no matter how packed your schedule may be, we can assist with accomplishing your objectives safely. Some events are associated with the seasons, such as the Rainbow Trail Easter events. Others may only be seen once in our city and then are held in a different part of England. Guildford Philharmonic Orchestra performances are not to be missed and are the perfect end to a business trip. If you are on a tight schedule but wish to enjoy a show at the Yvonne Arnaud Theatre, we can take you to the airport right after. People of all ages visit the city to learn more about the various historical landmarks that we have here. Our experienced Guildford minibus hire drivers know facts on the history of each building and will readily share them with you if you ask. You will leave feeling much more at home and have wonderful memories to share with your friends and relatives. Our minibus hire in Guildford can pick you up in the early morning and take you to any destination you choose. Enjoy a day of partying at a hotel to celebrate a birthday, sample the finest meals in local restaurants or reminisce about old times in traditional taverns. When you are ready to end the day, we will carry you back to your hotel or home. We will be there on time in our high-end vehicles. Booking transportation with our minibus hire in Guildford is easy. Visit our website at any time that is convenient to you and select your destination, pickup time and other relevant details of your trip. Give us a call if you have any questions at all about your trip. Our friendly representatives are always willing to assist you.